The fossilised skull of a hominid that lived 930,000 years ago has been found in Kenya, Science magazine reports. The creature may have belonged to the species Homo erectus, says the team which found it, even though its skull is smaller than previously seen. 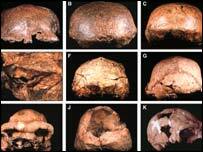 But the fossil has fuelled a debate over how we group these ancient humans. One camp claims H. erectus came in many shapes and sizes, while the other says it contains several species - which are incorrectly lumped together. Both camps think the new find supports their argument. The diminutive skull could either demonstrate how variable H. erectus was - or it could belong to an entirely different species, forcing scientists to rethink hominid classification. H. erectus lived between about two million and 400,000 years ago. According to one view, it evolved in Africa, but gradually migrated through the Old World. The first fossil specimen was identified by Eugène Dubois during the late 19th Century, in Java, Indonesia. Since then a collection of remains and artefacts have been found but, especially in Africa, the fossil record is pretty patchy. This has prevented scientists from gaining a clear picture of how much physical variation is "normal" for the species. Most of the fossils uncovered have displayed a degree of uniqueness. But it is hard to know whether H. erectus was highly variable, or whether several different species were in fact present. At the moment nearly every hominid find is placed under the "umbrella" of H erectus, but many researchers are unhappy about it. "Palaeoanthropologists often have this assumption that every hominid found from that time period is a H. erectus," said Jeffery Schwartz, of the University of Pittsburgh, US. 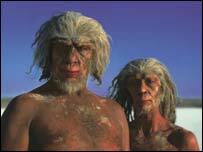 "They group hominids not on the basis of what they look like, but the time when they lived, which is totally unfounded. "There is a tradition of confusing diversity with variation." The new fossil, uncovered by a team led by Richard Potts, of the National Museum of Natural History in Washington DC, US, is, once again, unique. Although adult, it is much smaller than most other specimens and, according to Professor Schwartz, its skull is unlike the original "Java man" H. erectus. "In the Java specimen the forehead is very long and backwardly sloping and it has very thin projecting brow ridges," he told BBC News Online. "But in Potts' specimen the angle of the forehead is different and the shape of the brow ridges is different." But is it a different species? Professor Schwartz thinks so, but plenty of others do not. "It is probably the cranium of a teenage female H. erectus," said Tim White of the University of Berkeley, California, US. "Many species exhibit sexual dimorphism. Gorilla males have a big crest on the top of their heads, but the females never do. "Did H. erectus have sexual dimorphism? We don't know. But if there is no evidence of another lineage, why create one?" There is other evidence too, which might support the "one variable species" theory. Found near Professor Potts' fossil were hand-axes, typical of those associated with H. erectus. Not only that, but the hand-axes are quite big, suggesting they were made by larger individuals. This has led Professor Potts to speculate that "his" hominid was part of a single population containing both large and small individuals. And that could suggest broad physical variation existed happily within one species. "By virtue of being small it extends our understanding of the variation of physical features available at that time," said Professor Potts. Professor White and Professor Schwartz are very clear on where they stand in the dispute. So what does Professor Potts think? He is distancing himself from the whole argument. Although he says the individual shared many characteristics with H. erectus, he avoids calling it one. 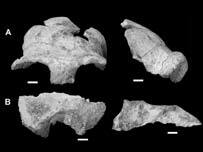 "We are not going to name this hominid, because we can't be sure," he said. "To my mind it is very difficult to say, just from the bones, where the species boundaries lie. "This debate generates a lot of heat but not a lot of light. What we are trying to do is reconstruct a very intricate and important process of how our own species arose." In Professor Potts' opinion, the only way to end the disagreement is to build up the fossil record. If scientists have a large fossil data-base, they will see patterns of similarities and differences. And then the species boundaries should become clear. He said: "We just have to undergo the hard work of going out to these field sites, and being really patient and accumulating enough fossils to answer these questions."